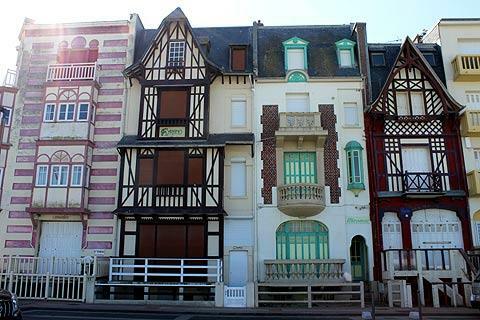 Mers-les-Bains is a seaside town that is notable for the Belle Epoque villas facing the ocean. 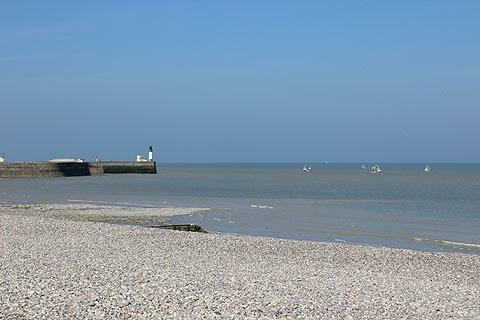 It is on the other side of the Bresle estuary from the busier town of Le-Treport. Along the seafront are the beautiful villas that were built at the end of the 19th century when the craze for 'sea-bathing began'. The villas not only have an attractive display of architectural features such as patterned wooden balconies, large bay windows and interesting shaped roofs - they are also painted in a wide-range of different colours. The villas on the seafront are particularly splendid but there are many others to admire throughout the town. All in all there are about 600 Belle Epoque villas and they are particularly attractive as the sun sets . Keep a lookout also for the pretty ceramic plaques with the names of the villas. The town has one of the largest collections of these ceramic name-plates. Mers les Bains has an art deco church, Saint Martin's church, and also you can walk to the religious statue of Notre Dame de la Falaise, which offers great views over the surroundings. 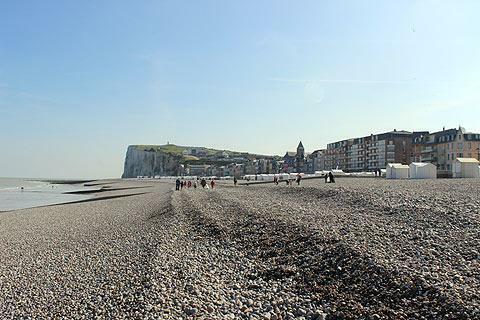 The beach itself is a long stretch of pebbly beach which is home to a ligne of white beach huts, adding to the Belle Epoque atmosphere of the town. At low tide there is a small sweep of sandy beech. At the end of the beach the white cliffs soar up and dominate the horizon. A particularly good time to visit is in July for the 'Fête des Baigneurs' when townsfolk dress in swimming costumes or dresses of the Belle Epoque. As well as admiring the architecure this is a great spot for windsurfing. 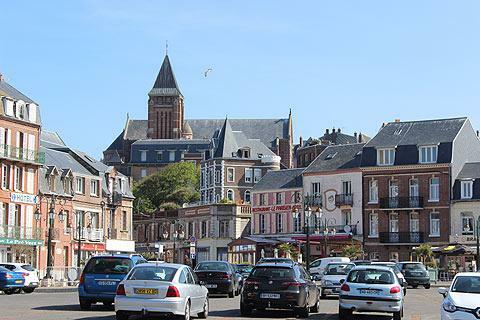 Mers-les-Bains is one of three neighbouring towns known collectively as the 'villes soeurs' or sister towns. 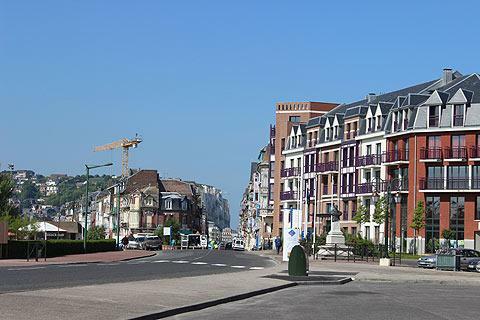 The others are Le-Treport which sits on the other side of the estuary and whilst not as pretty is a larger resort with more shops and restaurants etc. Eu is an attractive town set slightly inland and centered around a large chateau. 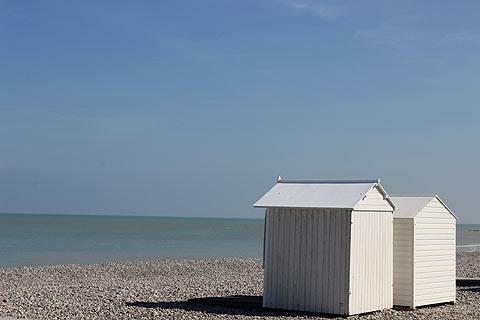 Fans of Belle Epoque villas will also want to visit the tiny resort of Le-Bois-de-Cise further up the coast, which also has some lovely villas set in the woods next to the coastline. There is also a great view point over the estuary of the Bay de Somme. The Somme Bay is one of France's 'Grand Sites' because of the importance of its wetland habitat. It is home to hundreds of species of migrating birds and it is considered to be one of the most beautiful bays in the world. You can find more local travel ideas in the Somme guide and the Picardie guide.